How to do this kriya. 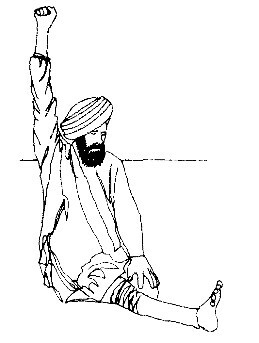 Sit on the left heel with the right leg extended forward. Stretch the right arm straight up and make a fist. Take long deep breaths, but try to squeeze the breath through the right nostril. Mentally vibrate "Sat" with the inhale and "Nam" with the exhale. Continue for 3 minutes. Then switch legs, arms, and nostrils. Begin a deep, powerful breath again for 3 minutes. What this kriya will do for you. This breathing kriya is to eliminate negativity and the urge to slander others rather than purify yourself. It stimulates the lymphatic system to clean itself. It increases nerve energy in the entire body.